This is the second year I will be giving this bags to our list.. not on the same people of course. Well, aside from this is a good idea for giveaways and cheap too, it comes with a cause. You can read it all HERE. Earlier, I went to the nearest bank to deposit my payment. I hope to have it just in time, my procrastination won, once again. Guys this bag is so cool and so chic! GO GREEN! Of all the designs, this is my favorite..
bakla, gusto ko toh!!! kasama ba ako sa list? ahihihihihi..
Not only chic but earth-friendly! 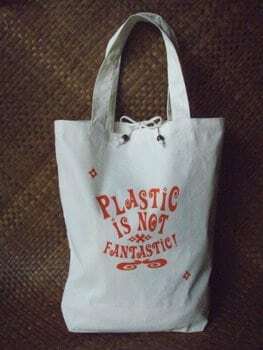 i love that design too: Plastic is Not Fantastic.. pero you know what, i used to work for a PET packaging company and if I had seen this post before, when I was still working there, i would say, Plastic IS Fantastic. hehe! pwedeng mapasama sa list? hehehe Anyway, ang ganda ng eco bag. simple yet very chic.